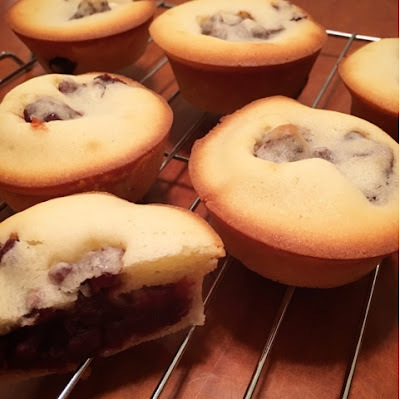 Hawaii Mom Blog: Mochi Cupcakes Recipe!!! I almost fell over when I saw my friend's picture of mochi cupcakes and quickly added a comment requesting the recipe. Being the super nice person she is, she quickly sent a link to the recipe. I didn't get to make them right away because I needed a can of koshi-an (sweetened red bean paste), but I thought about those mochi cupcakes daily. During those daily thoughts, I thought about filling substitutions like blueberry or peanut butter but ultimately decided to test the original recipe first. On my very next trip to Longs, I remembered to pick up a can of an. I prefer tsubuan (with beans) so I decided to use that instead. Here is a link to the recipe by yoo-eatz.com. It's super easy and super tasty. Just mix together: a box of mochiko, 1 1/4 cups sugar, 1 tsp baking powder, 1/4 tsp salt, 3 eggs, 1 1/2 cups milk, 3/4 cup vegetable oil, and 2 tsp vanilla extract. You probably have all that in your pantry! I didn't use cupcake liners so I greased two muffin tins. I filled them half way and then added about 1 1/2 T of an and covered with more batter, about 3/4 full. Bake for about 20 minutes at 375 degrees. Let cool! We got a little excited and discovered the filling was still hot! While my kids and I were eating the mochi cupcakes, I thought that I might have put too much filling because I really liked the mochi part of the cupcake and there didn't seem to be enough (so I had to eat another one). My daughter thought it was yummy just the way it was. We both agreed, if you love mochi, you've got to try these mochi cupcakes!